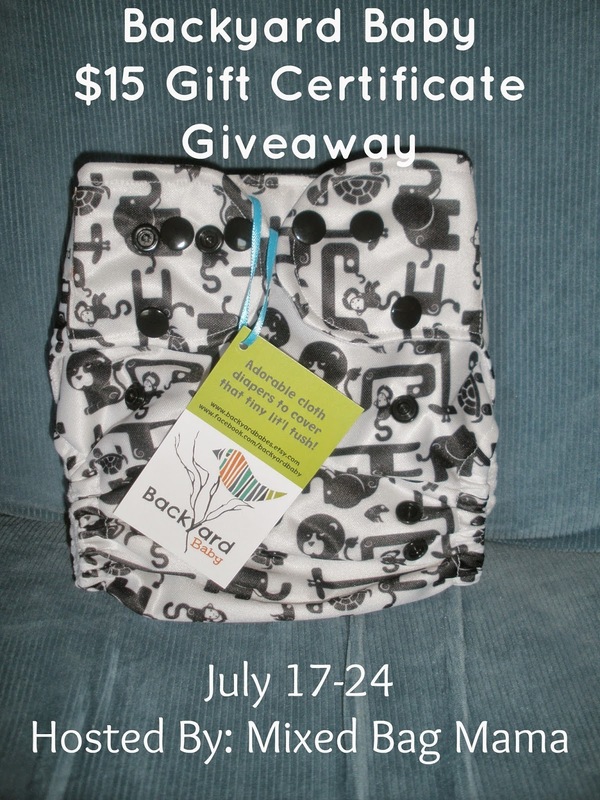 Welcome to the Backyard Baby $15 Gift Certificate Giveaway! Hey cloth diapering or cloth curious parents! How would you like to add a new diaper to your stash? Maybe you're just diving in to the cloth diaper world and want to try a few different kinds before committing to one or several brands? Or maybe you like supporting small businesses whenever possible? Whatever the case may be, here is your chance to win a $15 gift certificate to Backyard Baby so you can try one of their diapers for yourself! Alicia of Mixed Bag Mama recently had the opportunity to try one of their diapers with her daughter. You can read her full review HERE. To enter for your chance to win, simply enter the Giveaway Tools form below. Only your email address is required (only used to contact you if you are the winner), but the more optional entries you complete, the better your chances are of winning! Good luck! Disclaimer: Mixed Bag Mama was not compensated monetarily for this review or giveaway, nor were any participating bloggers. All opinions are my own and may differ from your own. This giveaway is in no way associated with any social media platforms, including Facebook, Twitter, Pinterest, and Instagram.